Goal: Create a reliable manpower assignment system to manage personnel assignments for the Marine Corps. The system needed automation to speed up the process of matching Marines with assignments and sending out the orders. Obstacle: Over the years, several highly manual ? and, in some cases, paper-based ?systems had been developed. An older version of MASS tended to break down when it was integrated with the Marine Corps' existing systems. Different systems were used for officers and enlisted personnel. Solution: The new MASS solution was developed with common business practices to make it integrate well with other systems. A high level of detail was built into MASS to help personnel mangers make good decisions quickly. Payoff: MASS has replaced dozens of disparate systems, including the paper-based ones. Tasks that once took days now take minutes using MASS' tools. The new system gives Marine Corps personnel more time to plan moves and prepare for new duties. Rick Steele The old personnel assignment system involved using a 4,000-page document, said Maj. Joseph Zimmerman, project officer at Marine Corps Systems Command. "Now I can do the same task in less than three minutes." Stacks of paper, hand-written notes and days of computer down time were all a part of the Marine Corps' old system of assigning and moving personnel from duty to duty. 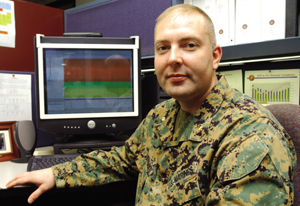 In 2000, InfoReliance Corp. won a contract to revamp the Marine Corps' Manpower Assignment Support System, a personnel management and budgeting system used by Corps monitors, who are the people who make assignments. The system, known as MASS, has transformed the way the Corps fills openings and manages its personnel, said Maj. Joseph Zimmerman, project officer at the Marine Corps Systems Command at Quantico Marine Base, Va.
"I used to use the old system and would have to go through a 4,000-page document in making an assignment," Zimmerman said. "It could take three days, where now I can do the same task in less than three minutes." While InfoReliance of Fairfax, Va., acted as the systems integrator on the project for the Marine Corps, the system has potential use by the other services or federal agencies, said Marshall Thames, vice president of operations at InfoReliance. The system was designed to be an enterprise application capable of incorporating smaller systems as the Defense Department continues its streamlining process. One of the biggest challenges InfoReliance faced was pulling together several systems that had been developed over the years, Thames said. "At one time, they had more than a dozen systems that they needed to consult to make assignment decisions, cut orders and then have those orders go out to the fleet," Thames said. "They would literally get hand trucks full of paper reports delivered twice a month that they would pour through and make manual scribbles on." These chores fell to the Marine Corps' assignment officers called monitors. Each monitor is in charge of a specific population of Marines, such as aviation colonels or riflemen. Some monitors were in charge of populations greater than 12,000 people, Thames said. Not only did the monitors have to keep track of all the openings within their populations, they had to find the best Marine to fill those positions. All that information was documented in inches-thick binders updated by hand. "The monitors would literally go home once a month and, for a day or two straight, transcribe their notes out of one binder into another," said Jeff Crosslin, InfoReliance's program manager at Quantico. Another issue was that the systems for officers and enlisted Marines were different. For officers, the monitors used an early version of MASS. But the system was so unreliable that the enlisted side stuck with the paper-based system. "When it was up, the old system was fairly decent," Zimmerman said. "The problem was that during critical times of year, we would lose our system for sometimes as long as three months." When underlying systems that the old system integrated with would change, the whole system would breakdown, Thames said. The answer was building a solution that used common business practices for both officers and enlisted personnel. Besides a stable system, monitors needed assistance making good matches between Marines and openings. "One of the biggest pieces of functionality with MASS is being able to query any information on any individual Marine," Zimmerman said. "You can go to their helmet size, their gas mask size, almost anything -- not that those are critical elements in an assignment process, but that gives you an idea of the detail level that we can pull into this system." Under the old system, connecting Marines and assignments was difficult because the process was so manual. The decision support and analytical capability of the MASS system is especially useful in finding assignments for Marines with children or a spouse with special medical care needs, for example. That data is included in MASS, and the Marine is assigned to a location where the proper medical services are available. The other issue facing monitors was the ability to make decisions faster. The Marine Corps' goal is to give personnel six months notice to prepare for a new assignment. Under the old system, a Marine could get just 30 days to plan a cross-country move. "The lack of notice became a retention issue," Thames said. The automation designed into MASS has sped up the process to the point where the service is close to reaching the six-month goal. Another factor that slowed down the process was delivering orders, Zimmerman said. Monitors relied on a mainframe system that had size limits that led to cryptic, and often misunderstood, messages. Or monitors used the Naval Messaging System to deliver orders, a use for which the system was not designed. Through MASS, there is a Web-based orders delivery system that is instantaneous to commanders in the fleet as well as to the individual Marine. With the success of the system, it has been expanded to include active reservists, and there are plans to expand it to other reservists, too. "Ultimately, the commander in the field gets one product and only has to manage one system," Zimmerman said. "It applies across the board to all their manpower resources."